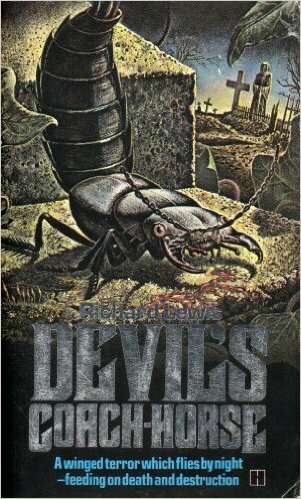 Devil’s Coach-Horse was first published in 1979 and, as with a lot of novels of the time, it is quite short; by today’s standards anyway. In fact many would class the work as being a novella and not a novel at all. Whether you class it as the one or the other, though, is neither here nor there, any story is only as long as it needs to be and Devil’s Coach-Horse accomplishes all it needs to do in fewer than 170 pages. I am not particularly frightened of bugs or anything creepy-crawly, so I was not at all freaked out by this story about killer-flesh-eating-insects that attack in deadly swarms leaving nothing but death and human offal in their wake. I can well imagine, however, that some readers might find themselves plugging up the gaps in the skirting board before they clamber into bed and leaving the bedroom windows shut for a few nights, while they have troubled dreams about flesh-burrowing insects. The story starts with a plane crash. The plane’s passengers are scientists who travel with a mixture of animal and invertebrate specimens. The invertebrates include: colorado beetles, stag beetles, hercules beetles, and, let us not forget, the devil’s coach-horse. When the plane crashes in the frozen mountains some of the beetles escape and search out the last pockets of warmth available to them—the bodies of the dead and dying. It is quite some time before the weather permits retrieval of the bodies and when the bodies do eventually reach the post mortem table the cause of death is so obvious that no one sees the need to be too thorough with the examinations. Had the intestines been removed then the pathologists may have discovered the bodies of the many frozen beetles and their eggs nestling amongst the pink ropes of flesh. But the intestines were not removed and the bodies were buried along with their secrets. When the eggs hatch the resulting insects have a taste for flesh and quite a few people die before anyone can accept the absurd idea of killer insects. But as the death toll rises there remains little choice but to accept the improbable truth and all the resources of Britain and the USA are turned towards stopping these six-legged nightmares before it is too late. Okay, it’s an unusual story and it is easy to say it is far fetched. When you think of the incredible real-life destructive power of a swarm of locusts though, perhaps it doesn’t seem so far fetched after all. Devil’s Coach-Horse is a little different from most of the books I read. It made a pleasant change for me and I read it in one sitting. I liked it very much. Now, where’s that can of fly spray ?